We were asked to do a 2-part audiovisual installation for a party. One part was themed “the 60’s”, the other was themed “the future”. 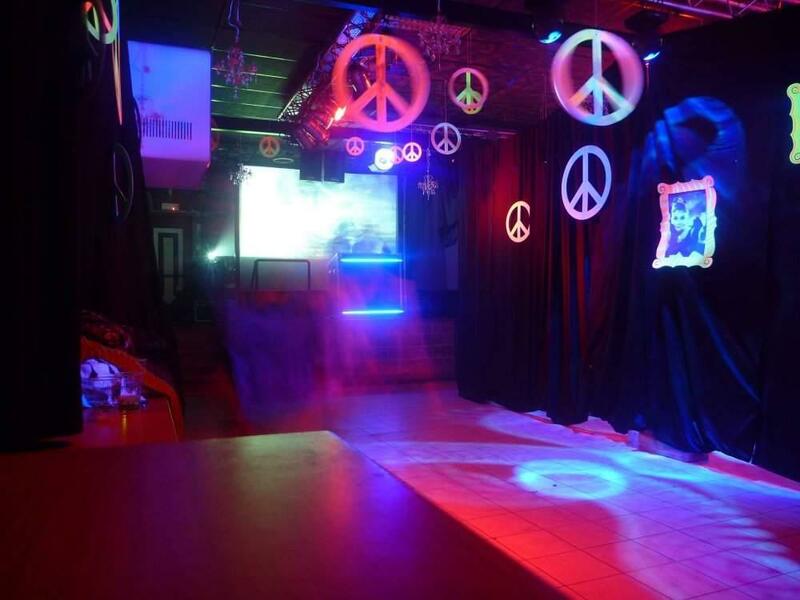 The first theme was relatively easy: a collection of visuals from typical 60’s themes. The future on the other hand, was a bit more complicated. 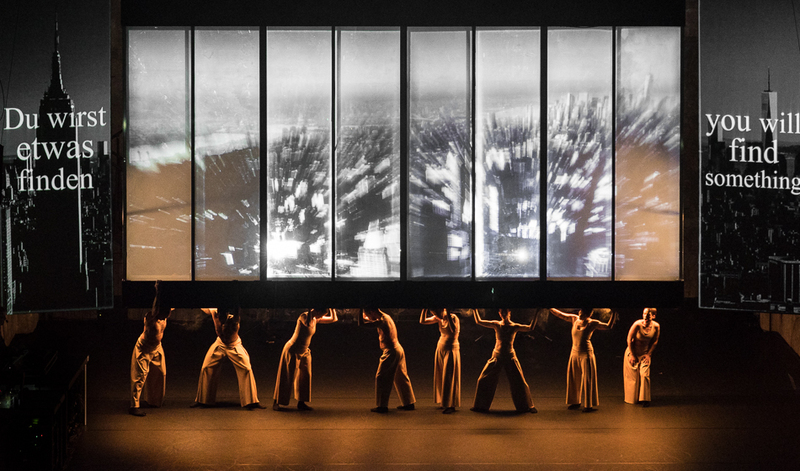 We opted for movement-reactive visuals to create an immersive experience for the viewer where DJ, audio and visuals became one harmonic – instead of the usual VJ set with visuals that tells mostly another story then the one the dj is trying to tell. 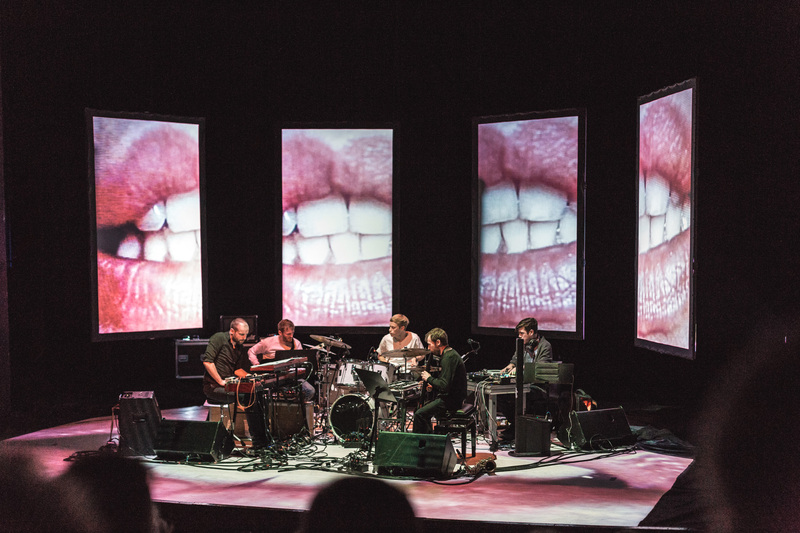 This article describes the setup and technical challenges we faced for “the future” part of the show. Given the goals above, we decided to go for a custom-made openframeworks app, running on OSX and returning output via Syphon to Resolume. 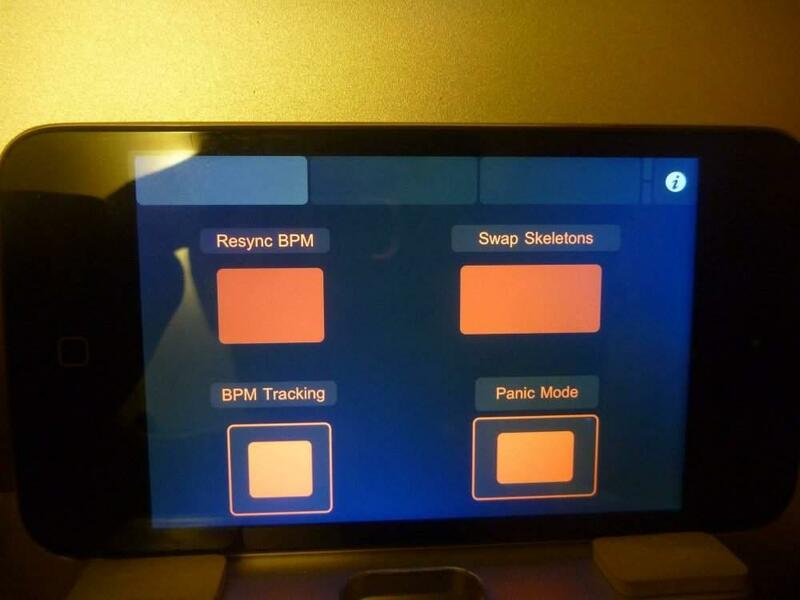 The controller can be an OSC remote control app running on iPad or iPod. This image shows our setup. 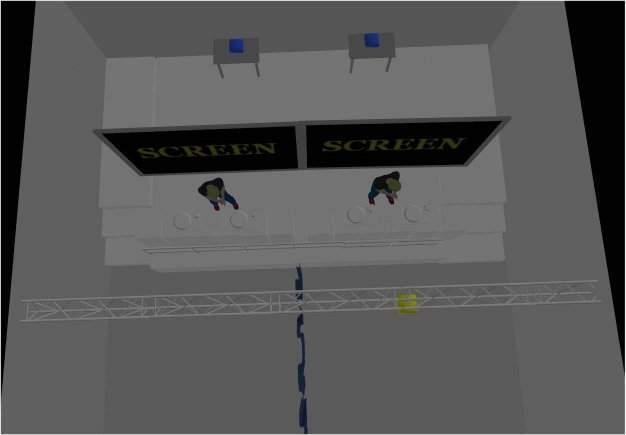 The yellow box is the kinect, located about 1 meter above the dj’s head and 2 meters in front. 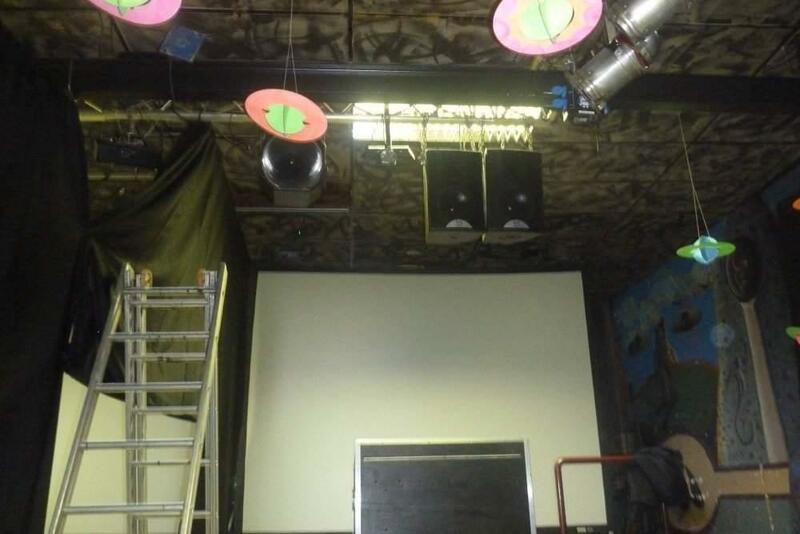 The blue boxes are shortthrow projectors. So that’s the venue and our setup, now on the the technical stuff! It started very simple at first. Then there came a max patch. Then another computer. Then realtime audio input. Then wifi + ipods. 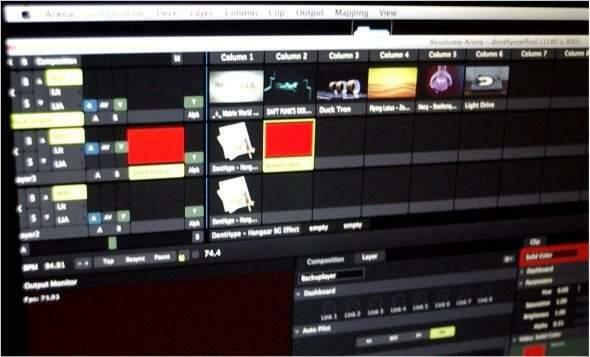 Then resolume. The kinect is the obvious choice here: it gives subjects contours and skeleton points, more than enough to go on. However, the environment was not that kinect-friendly. 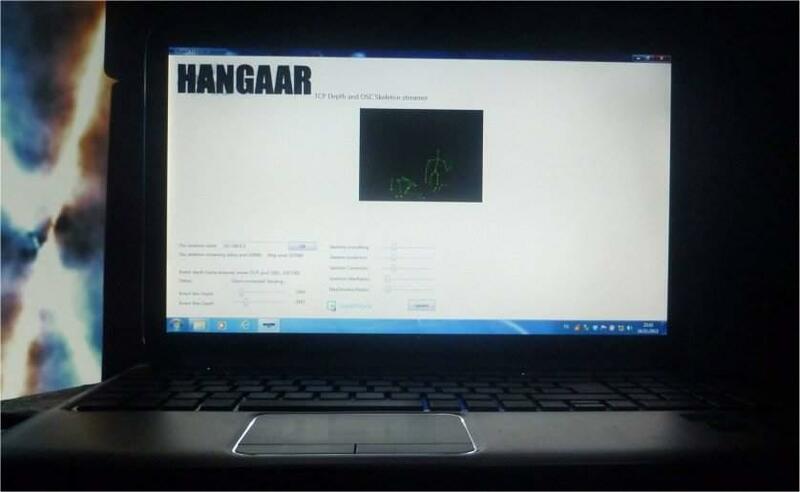 First tests showed that stage lights (PAR’s) emit to much infrared for the kinect to work properly. Throw out the pars and bring on LED’s! Second, fog and smoke needed to be at minimum levels, to avoid camera occlusion. Third, the Kinect could not be positioned optimally: it was 1m above the dj and 2 meters in front, with an angle adjustment of -27°. The biggest problem however was that about two thirds of the dj’s body were hidden behind the dj booth, so the kinect could not accuratly track the dj’s position and skeleton. This was difficult to deal with: the openNI drivers failed miserably here. The dj would have to be lifted or the booth lowered; both impossible or unpractical. Fortunately, the Microsoft drivers (1.6 SDK) feature seated mode: only tracking the upper part of the body by analyzing movement instead of the usual tracking by looking for human-like contours. Big hit on the CPU though. The tests were fruitful: once the dj moved enough, we could perfectly track the head & arms. There was a downside: the drivers were only available on Windows, and our framework needs Syphon so was build on OSX. 2 bits for the user ID implied that I could assign each pixel to one for 4 id’s. 6 bits for depth image gave us 64 depth values to work with. The kinect originally gives about 1024 depth values. So I rescaled our area of interest (dj booth -> screen) to 64 values. This was about 1.2 meters, so each depth value represented about 2 cm, which was sufficient. 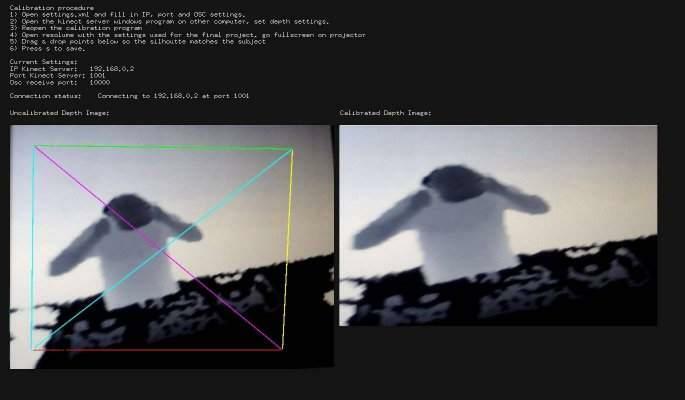 Such a frame was decoded in our openframeworks app into two separate images: the depth image (regular grayscale image) and the ‘label’ image (color image). 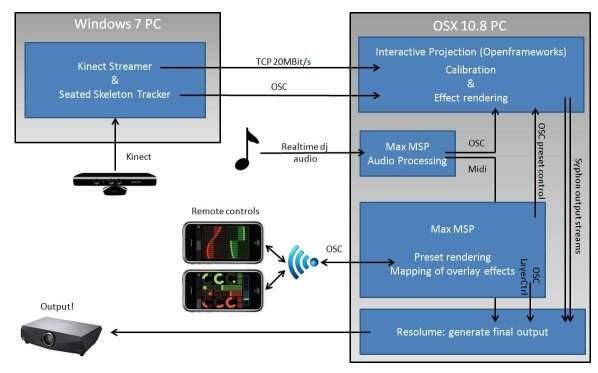 The openframeworks app ran on OSX, the kinect streamer works on windows. Both computers were connected with a straight ethernet cable, and given static ip’s for ease of use. 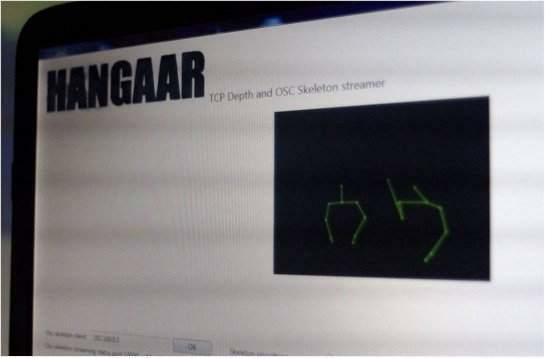 It worked quite well, and simultaneous UDP transmissions were not hindered by the streaming. Multithreading issues made my head explode. But in the end, it worked, it was fast, and stable. One app crashing did not crash the other, and boot times of the OSX app were cut very short cus it didn’t have to load the kinect drivers and framework. Furthermore, the kinect processing was not done anymore on the main OSX computer, making room for more cpu cycles for the final effects (the kinect uses quite a bit of cpu time and memory)! While some part of the skeleton could be tracked now and then in the regular standing mode, most part was jibberish. 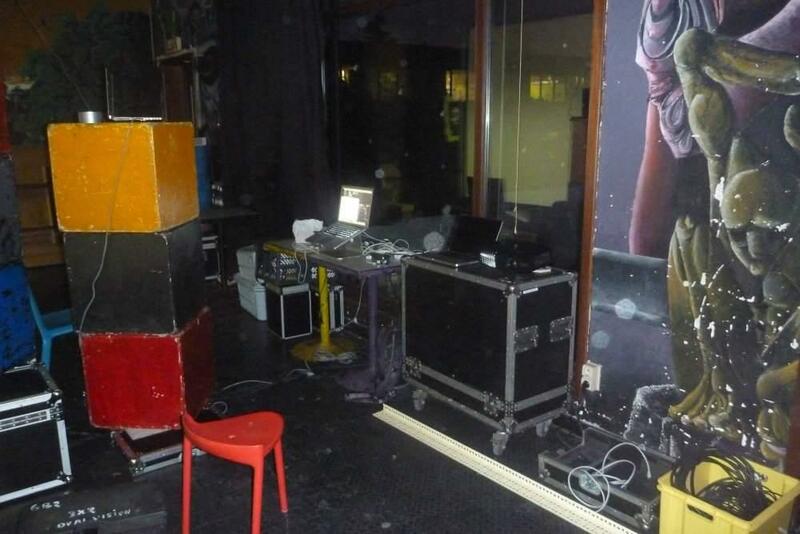 Making effects that align with the dj’s pose requires projector-kinect calibration. There are lots of tactics available, eg the chessboard techniques for RGBD camera’s, but I couldn’t get it to work (yet!). Basically what I wanted was that if I projected the contour of the dj, it should align good from the viewpoint of the audience. I made a small stupid calibration program, where you could drag the 4 edges of the kinect images so they matched the dj on the actual output. Put together with the openCV’s wrapIntoMe functionality and the ofxQuadWrap addon I could stretch the reconstructed label and depth images so they matched perfectly. The same goes for the skeleton points. So, for the effect programming, if I got the head coordinates, I knew they matched with the actual head position from the viewpoint. The wrapping does work when dj remains at one place (he could move 1 meter to the sides and a bit back/forward without too much misalignment). The calibration points were saved to an xml file and loaded in the main effects app. Simple, and fixed! Yes, its trial and error, quick & dirty, but hey, it works! I’m still looking for better solutions though. This is screenshot of the idea, but its captured afterwards with some depth image to show the principle. I didn’t want to continuously “tap bpm” to get audio-synced visuals. I didn’t want to manually sync resolume to our app and to the music. There is a simple app that analyses line-in output and sends out a synchronised midi clock: Wavetick. This works awesome but costs quite a bit for a one-off, and tests shown that dubstep and the like were not its favorite genres for beat tracking. On windows, the Audioboxbaby had the same functionality. However it was free, but otherwise had the same issues. Phase sync was lost regularly, and dubstep had no good results. So, let’s do this ourselves I thought. 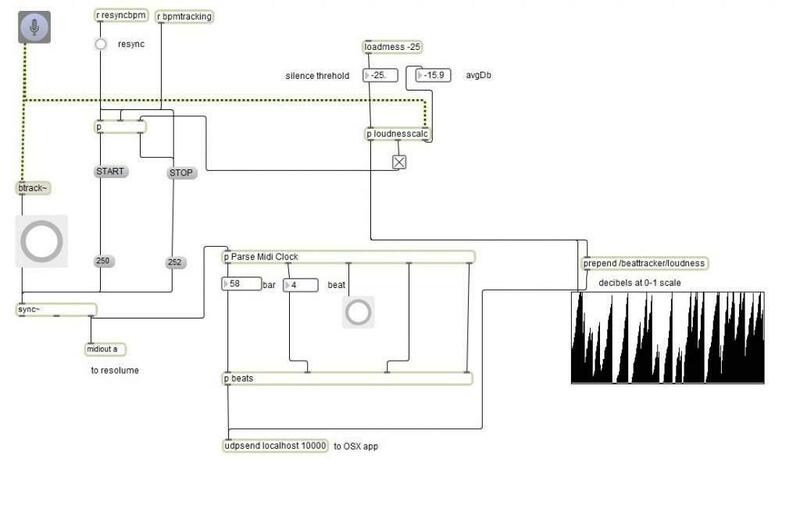 Thanks to Max MSP and some amazing free externals this was more easy than first thought. The btrack~ object tracks audio nicely and sends out a bang each beat. 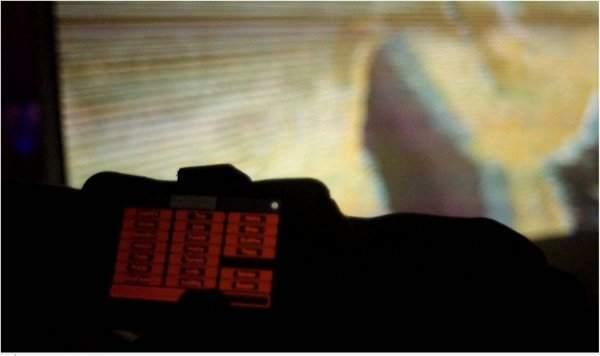 Then we have the sync~ object that synchronizes a midi clock to this. Using the OSX internal midi loopback, I could easily sync resolume to the beats. The same information was send to our app using OSC. The loudness~ external calculated the actual loudness of the sound, and sent that over osc as a 0->1 parameter. So our effects had as input: beat nr, bar nr, loudness and bpm. As this was known beforehand, we opted for OSX + Openframeworks + syphon. Instead of programming the transitions manually, we rendered 2 effects real-time and send them via 2 distinct syphon servers to resolume. This opened up options to add additional effects in resolume, a nice plus! Also a backup track was added in case things crashed, reverting to our beloved Beeple visuals :) There was a button “panic mode” (see later) for this. So we had all our real-time rendered effects, and the power of resolume. Awesome! The top layer is our “panic” layer. If something goes wrong, the opacity is set to the max and a random clip is played. Always handy to have some immediate backup ready. The actual backup clips were, unlike in this image, creative commons beeple clips. The second layer was our first syphon input, the third layer the second input. They both have 5 extra bpm synced effects, controllable by the dj’s guestures. Also the opacity was controlled using osc commands, so only the last selected effect would be visible. effect selection: select an effect; start rendering simultaneous with current, cross fade in resolume, stop old effect, open slot. So euhm, this is the max patch. Max users will recognise this :) Left is the main patch, right is the matrix mapping for additional resolume effects. There are filters and smoothers, somewhere. So now I could be in the audience and control the visuals with my iPod & touch OSC! This was becoming a mess, and I’m still surprised I could boot the whole setup with 4 clicks in total :D Anyway, the remote control mapping was done only half a day before the actual gig (hum) so this mess was to be expected. Loved it! Okay, so now we got all components linked and working nicely together. Time for the effects! They were all done beforehand as seperate openframework sketches. 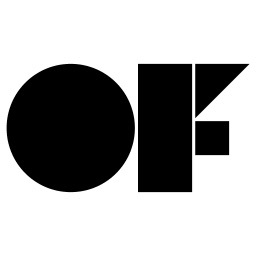 Openframework users will probably recognise some of them, such as the MSAFluids or ofxFX smoke. 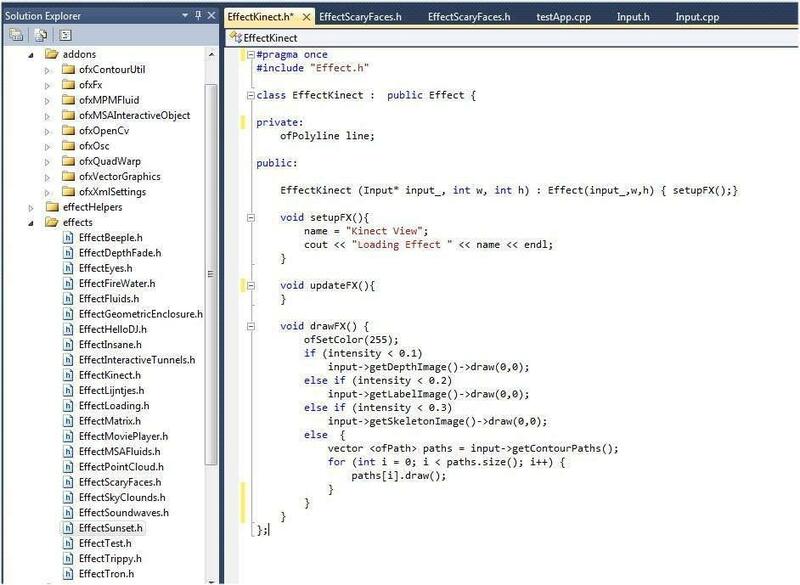 But, suffice to say we’ve made an c++ interface for each effect, doing most of the integration part in the framework. Each effect had only two methods in real ninja openframeworks style: update() and draw()! So once the framework was finished, I could really focus on the effects. Unfourtunatly, time ran out and I didn’t get anywhere near I wanted in terms of amount of effects. 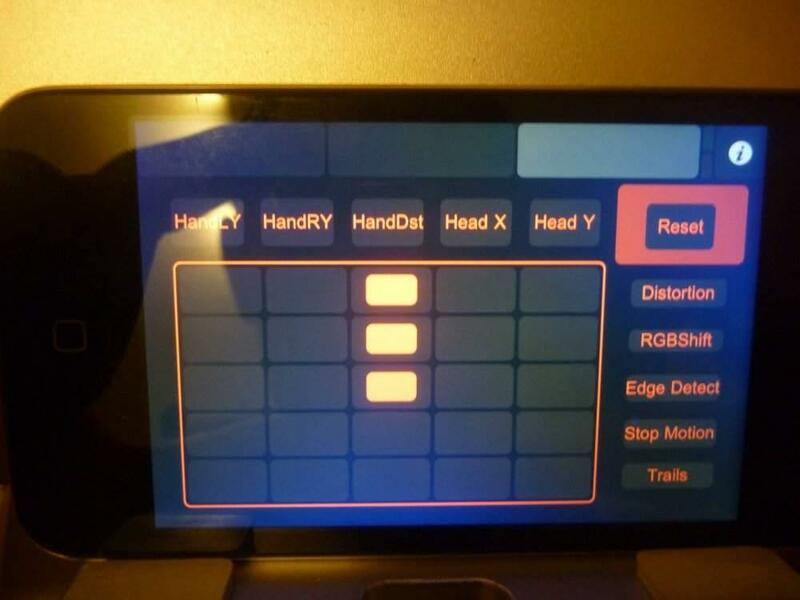 From inside each effect, you could easily get the amount of users, their calibrated silhoutte, head position or hand distance, audio features such as BPM, kinect stream, etc. The simplest of effects was just to show the calibrated kinect streams, of which the code is shown below. Because of the alignment, this was surprisingly a very good effect – especially in combition with the resolume effects such as rgbsplit or distort! Kinect Streamer on Windows (full compressed RGB Stream) + counterpart receiver in openframeworks. This will help a lot of people trying to use the kinect features of the MS SDK (facetracking, seated mode, etc) on mac. Maybe the calibration tool and effect framework. But this is soooo unuserfriendly that my old teachers would probably try to kill themselfs while using it.